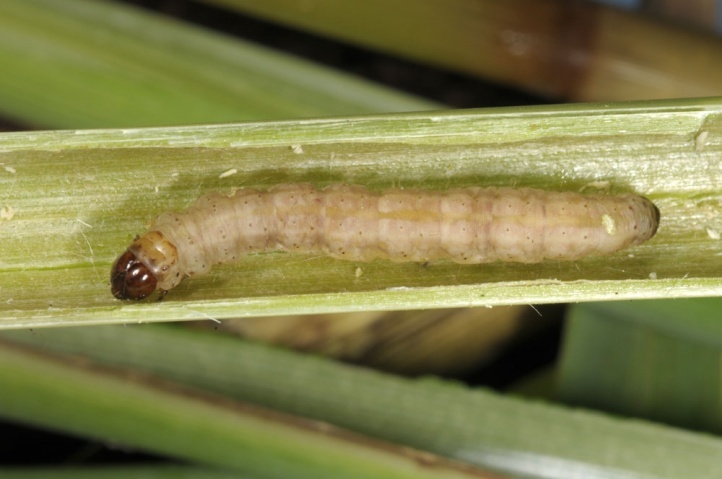 The caterpillars live in the stems of reed (Phragmites australis). 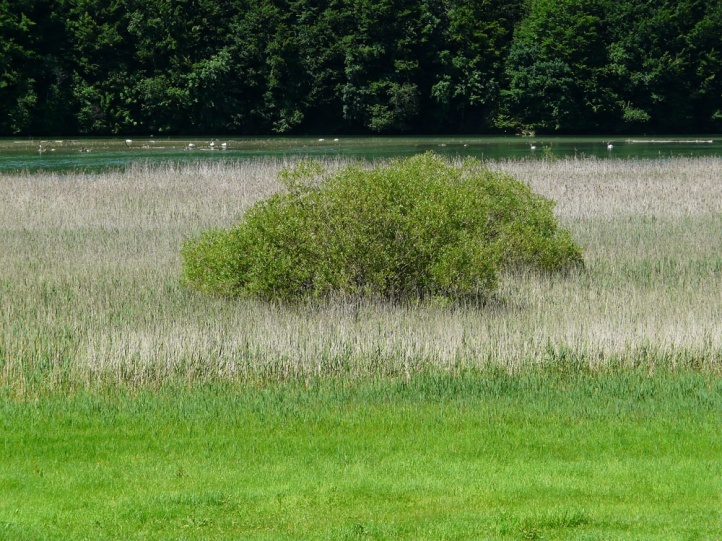 Archanara geminipuncta inhabits uncut reed beds of all kinds: the silting zones of rivers and lakes, ponds, or in isolation from water in moist depressions or other wet places. 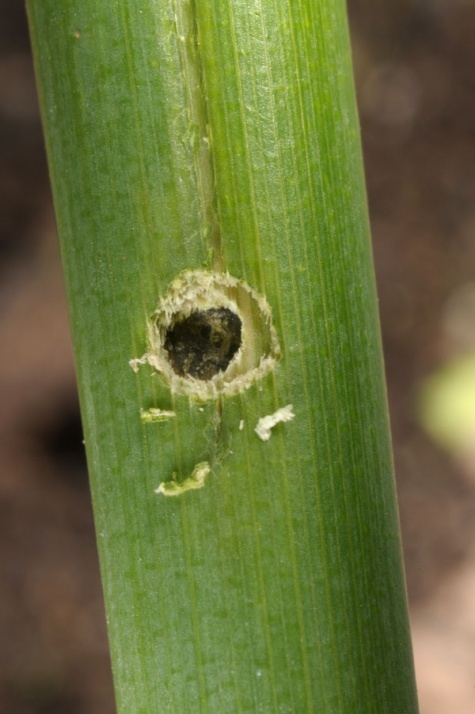 In Schwäbisch Gmünd - Wetzgau, I observed larvae in a small rest of reeds between residential development and a supermarket car park in 2011 and 2012. 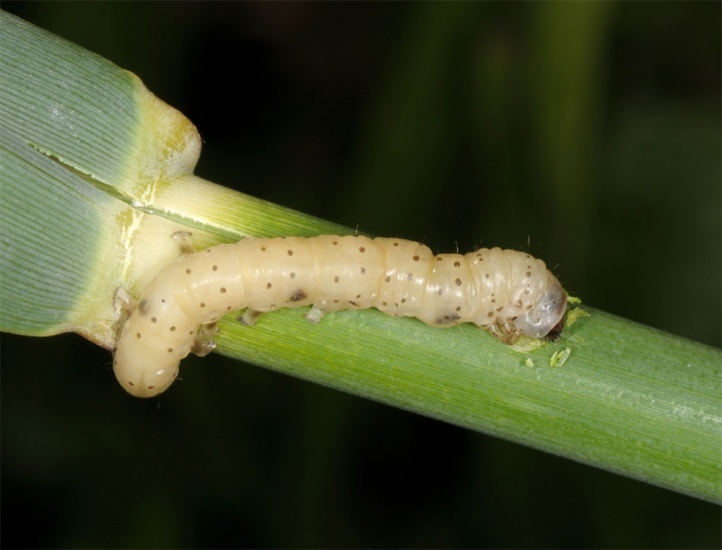 I found caterpillars together with Rhizedra lutosa in a narrow reed lined riverside along the river Jagst at Langenburg (eastern Baden-Wuerttemberg). 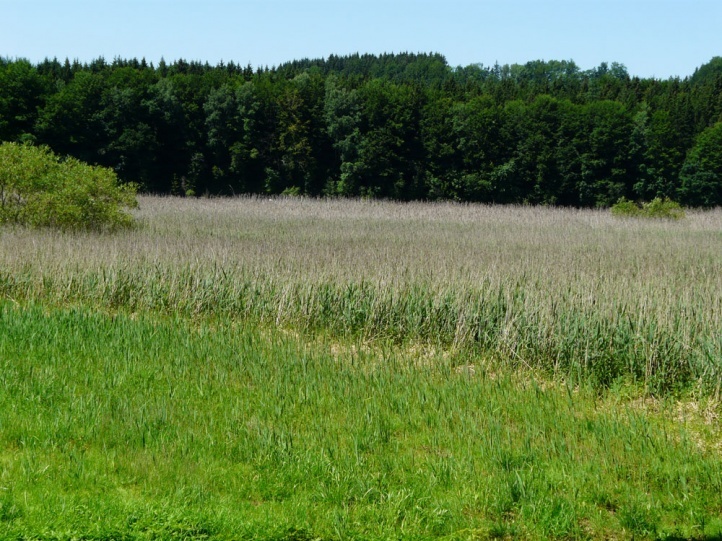 But mostly Archanara geminipuncta lives in in somewhat larger reeds such as at the river Iller at Oberbinnwang (southwest Bavaria), which are inhabited by one or more Archanara species. 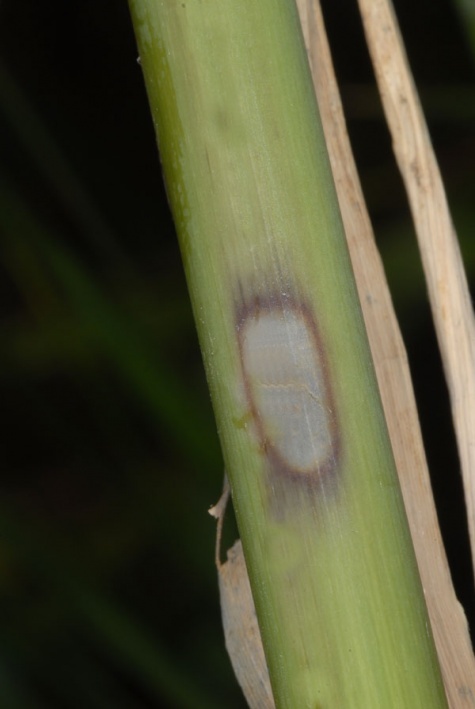 The egg overwinters in rows on reeds (especially on dry leaf sheaths). The caterpillar lives from late April to July and is much later (2-3 weeks) mature than Archanara neurica. I found the caterpillars from late May to early July. 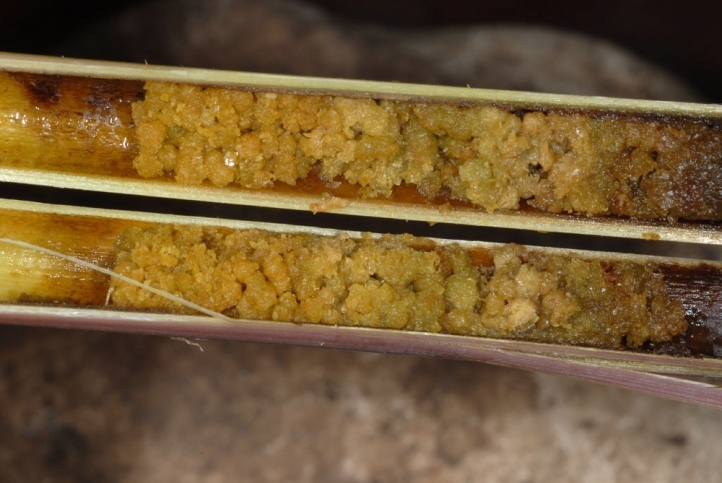 The infestation is identified by decaying straw tips (innermost leaves). The feeding pattern is the same as that of A. neurica. 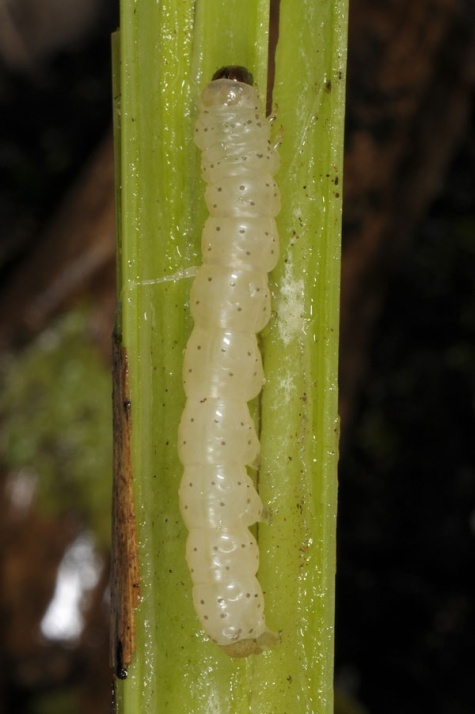 In contrast, with Rhizedra lutosa dies the whole stalk, as this caterpillar eats on and below ground level, while the Archanara larva live higher in the stem. 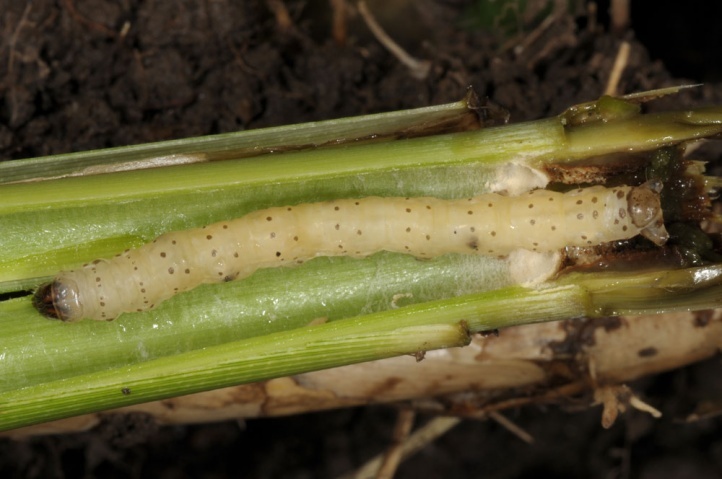 Often, the feeding pattern is pointing just to already abandoned stems, as the caterpillar changes it several times. Typical is the small circular boring hole. 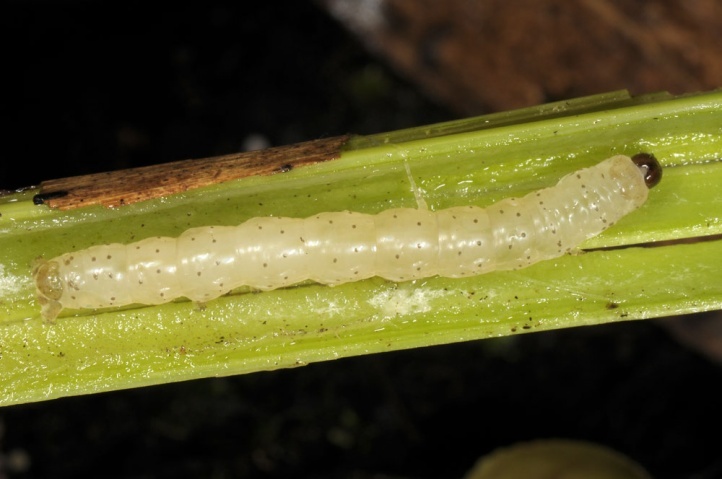 For pupation, the caterpillar prepares mostly a new stems as follows: it bores in the lower part of one of the lower or middle internodes and prepares in the top of this internode an elongated oval slip trap for the moths, which is only covered by the epidermis. 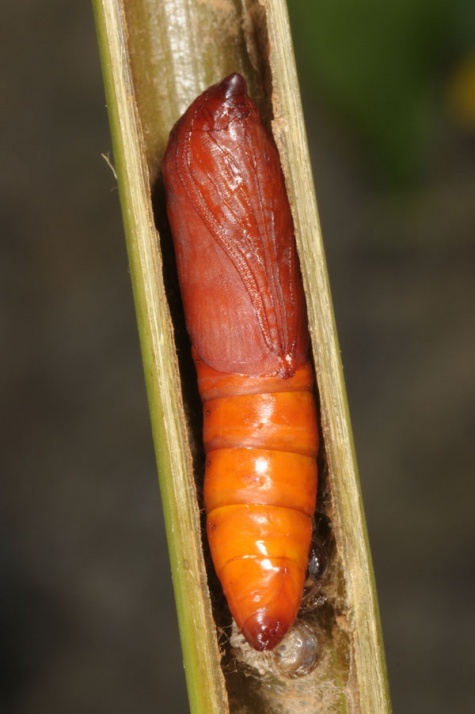 Below this the pupa rests with the head up. 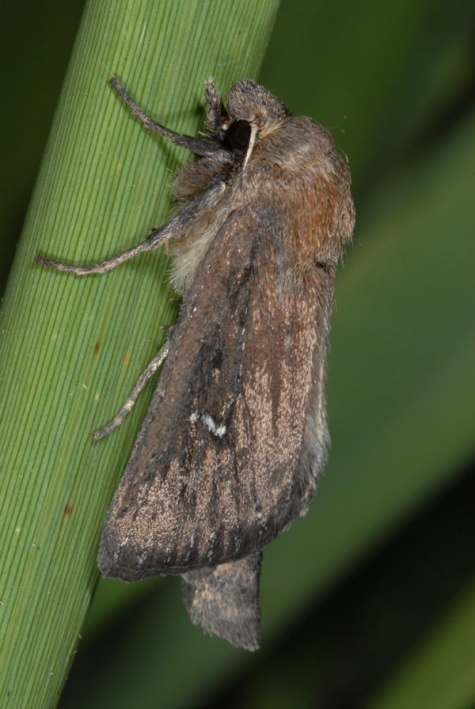 The moths fly from mid or late July until well into September with a strong peak in August. 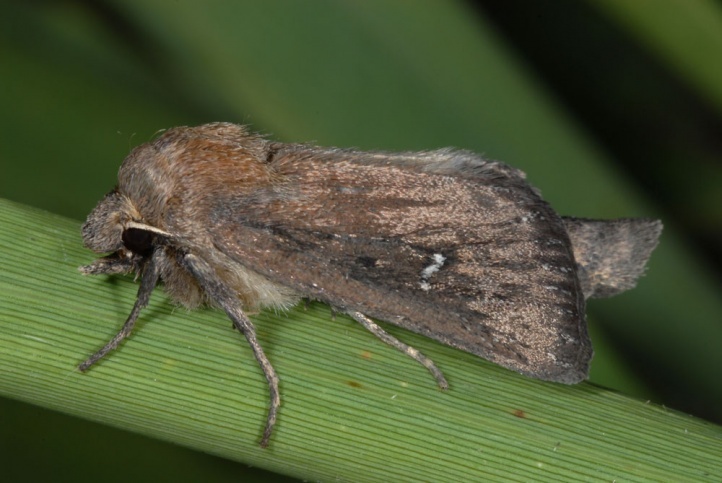 Archanara geminipuncta is in places at risk as mainly isolated reeds are increasingly harassed (conversion into corn fields, bush encroachment, mowing down directly to the waters edge, etc.). 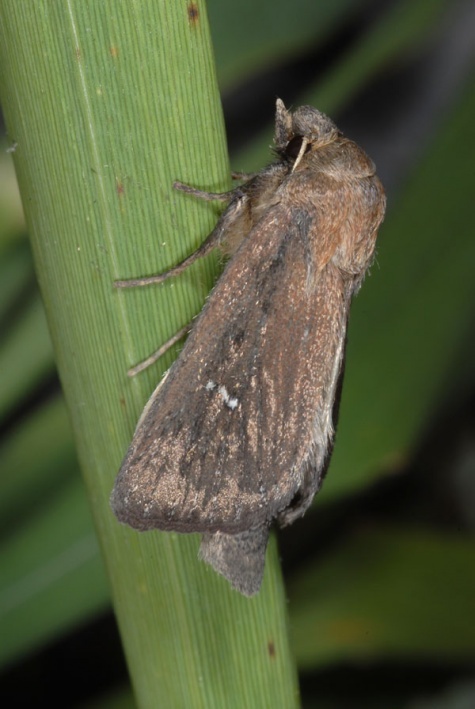 Overall, this is the still most widespread Archanara species. 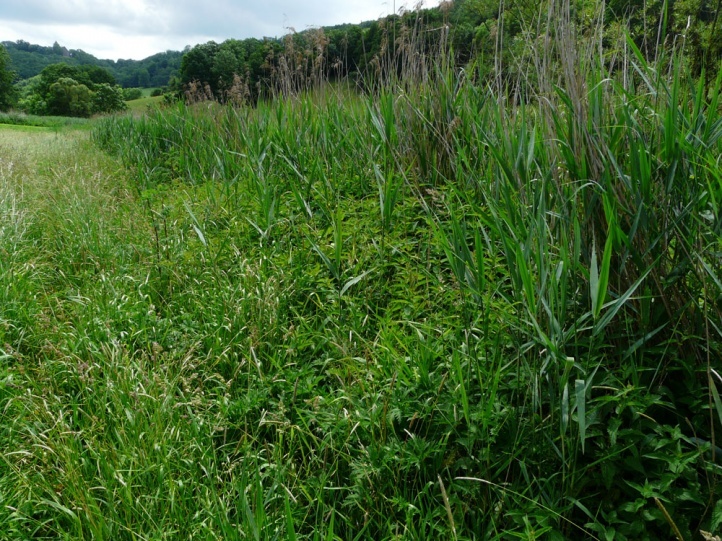 During the necessary maintenance measures in wetland meadows etc. 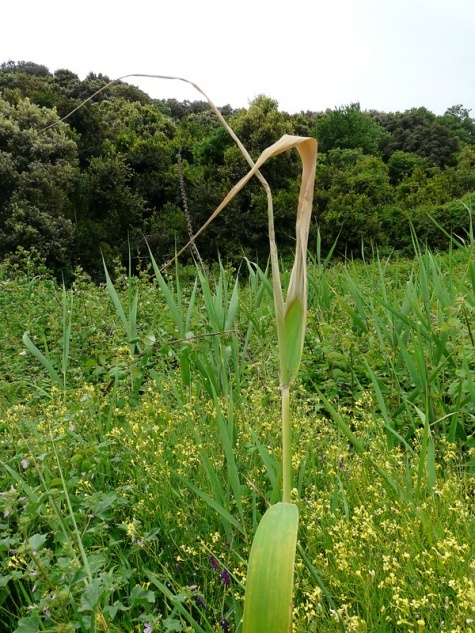 (mowing in autumn) should be ensured that remain also enough uncut reeds in the vicinita at less valuable spots. Archanara geminipuncta is widespread in Southern and Central Europe (north to southern Sweden and southern Finland) and in Western Asia (Turkey, Iraq, etc. ).